One of the changes I have (There has been slowness in this area.....) been trying to implement for our meals is more vegetables. I have always respected vegetables, believed in vegetables and wanted to eat more vegetables. But truthfully it was easier to gaze over dessert decisions instead of vegetable recipes. What I needed to do was find wonderful recipes for vegetables and salads and let the vegetable issue take care of itself. And now looking back, it has. While slow to take effect, there has also been some delicious successes along the way and this salad is one of them. Probably because it is so simple. Simple to prepare, with a simple list of ingredients and very delicious too. I found this on tasting spoons, Carolyn has a detailed eye for finding wonderful and different recipes. I often times look to her for inspiration for our Sunday dinners. 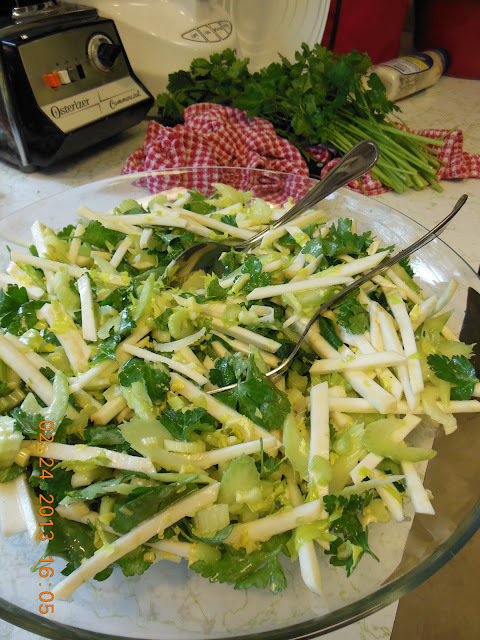 Peel and cut celery root into match-stick sized pieces, you may also grate using the large side of a box grater. Wash, dry and thinly slice the ribs of celery on a sharp diagonal. Remove the leaves only from the parsley, you will want at to fill a 1/2 cup measure, more is fine. Combine all ingredients in a large bowl.